If you're a fan of foldable phones, you're in luck, because there are plenty of them on the way: Samsung and LG are just two of the manufacturers who are planning handsets with a foldable screen. Here, we're focusing on yet another company getting involved – Huawei. All we know for sure is that Huawei has a foldable phone on the way – company execs have confirmed that much – but as for specs and design we're relying on leaks and rumours for the time being. Here's everything we've heard about the upcoming foldable phone so far. We know that Huawei is planning a foldable phone, because CEO Richard Yu has said so. "We are already working on it," Yu said in September 2018, adding that it would be out within 12 months. So August 2019 then? Or potentially even earlier. With no exact launch date yet specified, we can only make educated guesses, but the foldable Huawei phone could appear at Mobile World Congress at the end of February 2019. Or it could show up alongside the successors to the Huawei P20 phones – which are likely to appear at some point in March. Considering the advanced technology a foldable phone is going to need, we think something around July or August time is more likely. And the price? Well, it won't be cheap, that's for sure: foldable screens need a lot of research, development, and manufacturing cash, like any emerging technology. The Huawei Mate 10 Pro originally cost £699/$799, so think about something above and beyond that. 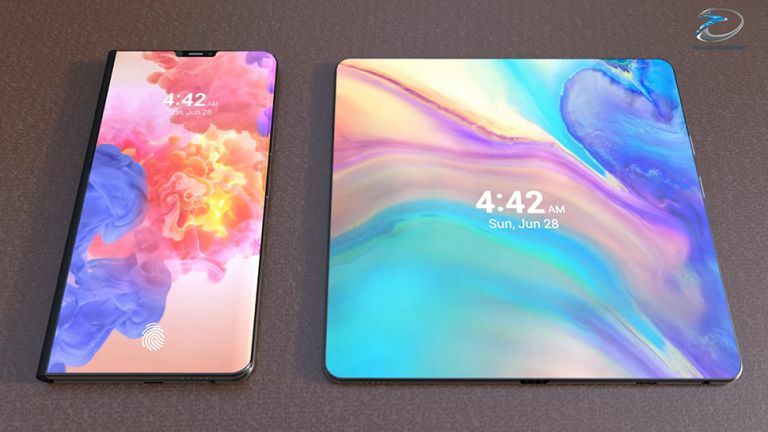 This 2019 phone is going to have a foldable, hinged screen – something you might have sussed from the title of this article. How exactly that's going to work isn't quite clear, but this concept video from TechConfigurations gives you some idea, a concept video based on patents filed by Huawei. The handset will probably look a little like two smartphones stuck together, so you get the usual front display (with a notch) and a back camera. The device's party trick, though, will be the way it can fold outwards to reveal a hinged screen in the middle – one that you might use to play games, for example, or as a mini laptop (with a keyboard on one screen and your apps on another). As yet we don't know exactly how big these displays will be, but given Huawei's fondness for large screens, we could be looking at well over 6 inches for the individual displays, and even more when the displays are folded out and laid flat. It seems probably that Huawei will want to kit out this phone with the best specs it can throw at it, so we're thinking the Kirin 980 processor will be out, and the Kirin 990 (or whatever it ends up being called) will be in. Huawei's own chips are usually very capable and the 2019 update should be no different. Aside from that, the phone is going to need a decent amount of RAM and a pretty large battery to handle those multiple screens: something like 6GB or 8GB of RAM should do it. The internal storage should be pretty generous as well, and might well be able to be augmented with the nano SD memory cards Huawei is reportedly on the verge of launching (see the Mate 20 phone for details). Camera-wise, Huawei loves to pack dual and even triple-lens sensors into its phones. With the foldable screen the main selling point of this particular handset, Huawei could settle for a dual-lens configuration in this case – possibly with a 24MP rating overall. According to reports, Huawei is rather keen on beating Samsung to the punch when it comes to launching a foldable phone, and it's also keen on adding another feature to the mix: 5G. The foldable handset should work on the fastest 5G networks around the world once it sees the light of day. Fingers crossed for waterproofing and wireless charging, though with all the other tech Huawei is reportedly cramming into this handset, some compromises might have to be made along the way. You can't have absolutely everything packed inside the same smartphone... or can you? Finally, it remains to be seen whether Huawei can also squeeze an in-screen fingerprint sensor into the overall foldable phone package – the tech is reportedly coming to the Huawei Mate 20, so it could well be on the cards. Something we can say with confidence is this is lining up to be one of the phones of 2019.